Forget the Energy Price Cap - Switch & save even more instead. There's no point getting mad about the Energy Price Cap. Switch and save even more than the cap today. Millions of households have seen the cost of their energy tariff increase by another 10% today after Ofgem announced the new level of their price cap. But rather than getting angry or dramatising about the price rise, consumers are being reminded they can still save hundreds of pounds by switching supplier – and it’s never been easier to do this. On Thursday 7th February 2019, Ofgem confirmed the energy “price cap” will rise by 10% (£117 per year) from April 1st. Given the cap was only implemented at the start of January, headlines such as “Fury as energy bills soar again” and “Millions misled by ‘scandalous and fake’ energy price cap claims” have already appeared in the media. However, according to Flipper, the UK’s only independent auto-switching service, articles like these are unhelpful. Instead of creating anger towards Ofgem and the energy suppliers, consumers should be being offered advice on how to get on a better deal. The level of the cap is partly determined by the wholesale cost of energy, which is what energy suppliers pay for the energy they sell on to their customers. “With wholesale costs having risen by around 20% during the period used to calculate what the cap should be, I can’t see what else Ofgem could have done. An increase in the level of the cap was inevitable,” continued Mark, “but blaming Ofgem and the retail suppliers for this isn’t going to change the price you pay”. Even before this latest price rise takes effect in April, consumers on a typical standard tariff can still save more than £200 per year by moving to one of the best deals available. Mark said: “Ofgem itself is clear that rather than rely on the cap customers should be shopping around. We saw a record number of households - nearly 5.9 million - switch their supplier last year and we hope to see that trend continue”. In just a few years Flipper has saved its members over £10m by “auto-switching” them to new suppliers when better deals become available. Not only do Flipper members save, on average, £385 off their annual bills, they also save hours from having to trawl comparison sites as Flipper does everything for them. 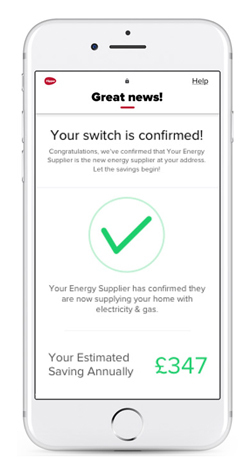 Staying on the capped standard tariff will only put yourself out of pocket - so why not see how much Flipper can save you by finding and keeping you on the cheapest energy deals, continuously.